Data transformers are used to translate the data for a field into a format that can be displayed in a form (and back on submit). They're already used internally for many field types. For example, the date field type can be rendered as a yyyy-MM-dd-formatted input textbox. Internally, a data transformer converts the starting DateTime value of the field into the yyyy-MM-dd string to render the form, and then back into a DateTime object on submit. When a form field has the inherit_data option set, Data Transformers won't be applied to that field. Internally the tags are stored as an array, but displayed to the user as a simple comma seperated string to make them easier to edit. The CallbackTransformer takes two callback functions as arguments. The first transforms the original value into a format that'll be used to render the field. The second does the reverse: it transforms the submitted value back into the format you'll use in your code. The addModelTransformer() method accepts any object that implements DataTransformerInterface - so you can create your own classes, instead of putting all the logic in the form (see the next section). Say you have a many-to-one relation from the Task entity to an Issue entity (i.e. each Task has an optional foreign key to its related Issue). Adding a listbox with all possible issues could eventually get really long and take a long time to load. Instead, you decide you want to add a textbox, where the user can simply enter the issue number. Good start! But if you stopped here and submitted the form, the Task's issue property would be a string (e.g. "55"). How can you transform this into an Issue entity on submit? You could use the CallbackTransformer like earlier. But since this is a bit more complex, creating a new transformer class will keep the TaskType form class simpler. Just like in the first example, a transformer has two directions. The transform() method is responsible for converting the data used in your code to a format that can be rendered in your form (e.g. an Issue object to its id, a string). The reverseTransform() method does the reverse: it converts the submitted value back into the format you want (e.g. convert the id back to the Issue object). To cause a validation error, throw a TransformationFailedException. But the message you pass to this exception won't be shown to the user. You'll set that message with the invalid_message option (see below). When null is passed to the transform() method, your transformer should return an equivalent value of the type it is transforming to (e.g. an empty string, 0 for integers or 0.0 for floats). Next, you need to instantiate the IssueToNumberTransformer class from inside TaskType and add it to the issue field. But to do that, you'll need an instance of the entity manager (because IssueToNumberTransformer needs this). To make this step easier (especially if TaskType is embedded into other form type classes), you might choose to register your form type as a service. Cool, you're done! Your user will be able to enter an issue number into the text field and it will be transformed back into an Issue object. This means that, after a successful submission, the Form component will pass a real Issue object to Task::setIssue() instead of the issue number. In the above example, you applied the transformer to a normal text field. But if you do this transformation a lot, it might be better to create a custom field type. that does this automatically. Great! This will act and render like a text field (getParent()), but will automatically have the data transformer and a nice default value for the invalid_message option. In the above example, the transformer was used as a "model" transformer. In fact, there are two different types of transformers and three different types of underlying data. Model data - This is the data in the format used in your application (e.g. an Issue object). If you call Form::getData() or Form::setData(), you're dealing with the "model" data. Norm Data - This is a normalized version of your data and is commonly the same as your "model" data (though not in our example). It's not commonly used directly. View Data - This is the format that's used to fill in the form fields themselves. It's also the format in which the user will submit the data. When you call Form::submit($data), the $data is in the "view" data format. 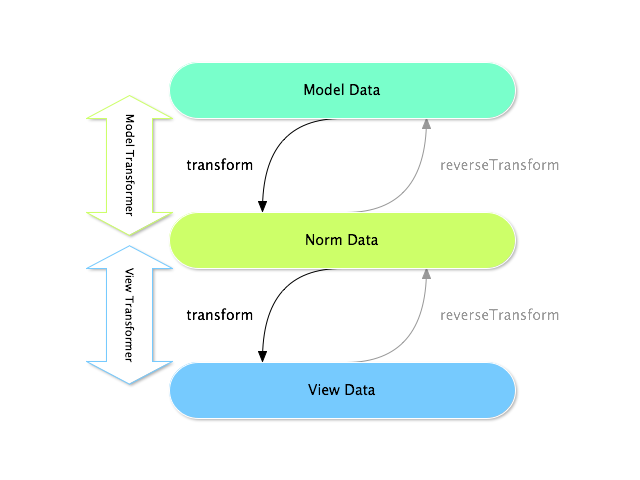 transform: "model data" => "norm data"
reverseTransform: "norm data" => "model data"
transform: "norm data" => "view data"
reverseTransform: "view data" => "norm data"
To use the view transformer, call addViewTransformer. In this example, the field is a text field, and a text field is always expected to be a simple, scalar format in the "norm" and "view" formats. For this reason, the most appropriate transformer was the "model" transformer (which converts to/from the norm format - string issue number - to the model format - Issue object). As a general rule, the normalized data should contain as much information as possible.